We continue our series of silent auction tips that come right from our “in the trenches” experience. If you read our previous posts, then you learned all about how to treat your auction like a business. In this post, we are going to talk about all things related to merchandising. The dictionary defines it as “the activity of promoting the sale of goods, especially by their presentation in retail outlets.” Wow - a lot to digest. Simply put, it is how you layout a store and display products. Your auction is a retail store (even if you are doing it online). Proper displays can go a long way to getting your bidders connected and bidding in your auction. Here are some things to consider related to item displays for both online and physical auctions. Any old photo WON’T DO! Make sure the quality of the images are as high as possible. Most online auction systems will adjust photos to display on various devices (we do this at Handbid), so make sure you are providing high-quality images so it has something to work with. Nothing looks worse than a grainy, blurry photo. 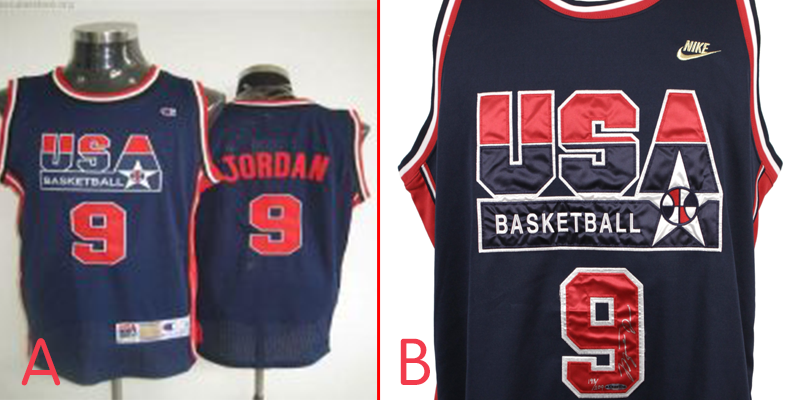 Just look at these two photos and decide, which one would make you more willing to bid on an item? Your job in the description is to sell the item to an online or remote bidder. Make it short but inviting. Don’t leave out key details. As we mentioned, your auction area is a retail store. We suspect you are not formally trained in retail merchandising. The good news is that you don’t have to be, but here are some strategies that you can employ to improve the engagement of your bidders at your event. Where will you layout your items? Often times, the silent auction is an afterthought, placed around dining areas, tables, bar areas. 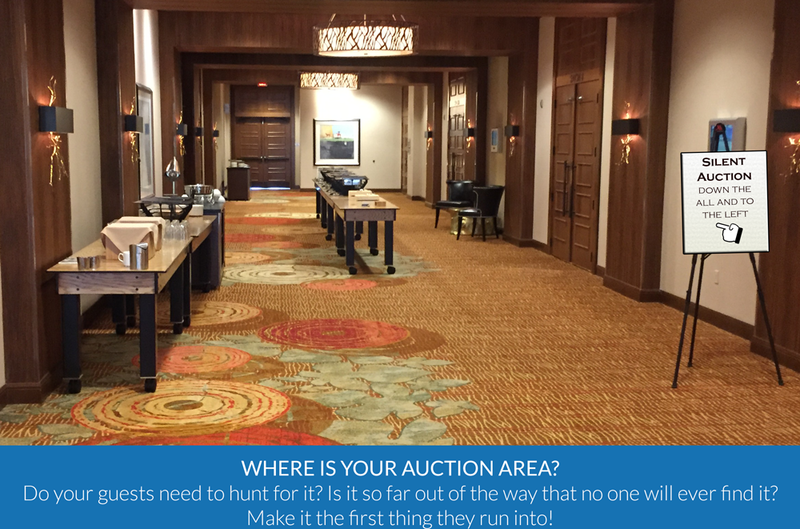 Make sure you think carefully about where you place your auction area as it relates to check-in, reception, dinner/dining, and checkout. You will need traffic flow and shouldn't make it difficult for your bidders to visit the auction area. As people enter your event, have a plan for how they will walk through the room. After check-in, people typically will want to get a drink or hours d’oeuvres and then browse the auction area before dinner. Have you arranged your products to accommodate this behavior pattern? Is your auction area on the opposite end of the venue from the bar or registration? Are servers passing drinks or appetizers out around the auction area so people can stay there to look at items? Successful retailers have figured out that certain tactics work to hook in shoppers and get them to buy. You want people to visit and hang around a bit. The longer they are there the more likely they are to bid on something. So, as you setup your auction, put yourself in your bidder’s shoes: would you want to hang out and shop in the area you have setup? Talking with bidders will draw them in closer and get them engaged. Have volunteers (with iPads if you are using Handbid) placed around the auction area to promote items and answer questions bidders have. Make sure your volunteers are knowledgeable about the items. Get your volunteers to promote and sell for you. Space matters. If you make the area too crowded where people can’t easily walk around, then most will migrate somewhere else. It is important to provide enough space where people feel comfortable. People won’t squeeze, they hate to be “brushed” by others, and want to be able to access items up close before they bid. Display your items. Don’t leave items in boxes! If you have a physical item and can show it on the table, wall or hanging from the ceiling...do it! People want to see and touch items that they intend to purchase. At one event we attended, a tent was up for bid. It was sitting in a small box on the table. It had no bids. One bidder mentioned to us, "do you realize that that is a $600 tent currently going for $100?" We had no idea.We couldn't tell how big it was or even what it looked like. Now, you may not have room to pitch a tent in your auction space, but at least take some photos of it. No one likes a crowded room except a pick-pocket, so make sure you plan to give your auction area enough space for your guests to comfortably browse. When planning your event, ask yourself, "Is the room/venue large enough to display your auction items as well as host all of the event attendees?" A good way to think about this is the “red wine test.” If you have rows of display tables, guests should be able to stand back to back and bend over to read the description on the auction item without bumping into each other, while allowing a third guest to walk comfortably between them with a glass of red wine in their hand. This is about four to six feet of space between rows of tables. Does your space pass the “red wine test?” If you have a crowded room, anything less than this amount of space is uncomfortably tight for your guests. Additionally, the room should have enough display space. If it’s worth selling, it’s worth showing. I have been to many auctions where the room was too crowded for guests to walk around the silent auction area. While mobile bidding helps to somewhat off-set this problem, it doesn’t help the overall guest experience of the auction. 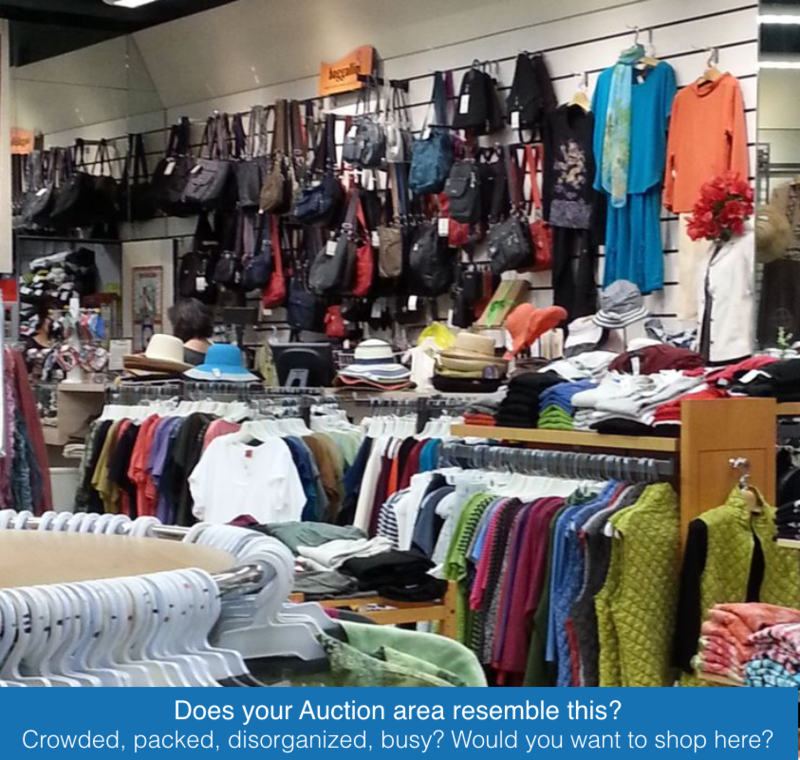 Next, think about the layout of your auction area. Where will guests enter and exit the room? Will you have food passed or available in the same area? Can your guests easily grab a drink and continue to browse your items? These are important considerations when setting up an auction area. It should FEEL comfortable as well as LOOK inviting to all guests. While ambiance or “mood” lighting may match the elegance of your event, it makes it difficult to sell your items. Guests need to see items, be able to read descriptions and have a clear understanding of what they are bidding on. 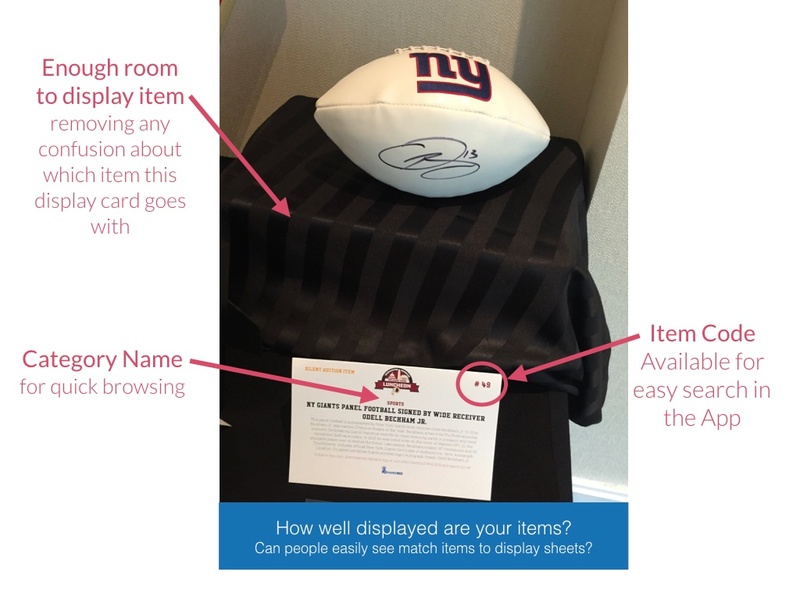 Even in a mobile bidding situation where descriptions are also available on their phones, guests want to look at gift baskets, see artwork, and examine autographs. Adequately lighting your auction items is essential. Highlight your goods. During the live auction, your auctioneer needs to be able to see bidders and bid cards. In both situations, poor lighting will often hurt the outcome of an auction. You want your guests to pay top dollar for your auction items. To make this happen, items should be displayed as if they were in a high-end retail store. If they look like they are in bulk retail, expect bulk-retail prices. We have seen some amazing displays, and we have seen some “not so amazing”. Here is an example of a well-organized auction display. Lots of light, lots of room, good labeling of the item. You can save a ton of space by using mobile bidding and removing bid sheets from the tables. The next photo is a great example of product merchandising at an auction. Each item has a bid number that can be easily found in our Handbid smartphone app and there is no need to have bid sheets everywhere. Believe it or not, there is a science to how people shop. In fact, there is a ton of research behind shopping behavior. One of the most well-known books on the topic was first introduced in 1999: Why We Buy, by Paco Underhilll. By closely observing shoppers, Underhill was able to draw remarkable conclusions about how to better configure retail stores to increase sales. And, lucky for us, many of the principles he recommends also apply to your silent auction areas. Just like in a retail store where converting customers into sales is the objective, getting bidders to bid more often on auction items is your primary objective. So how do we do that? We do it with good merchandising practices mentioned above. Have a gas grill you are auctioning off? Put it together to show off the final product. Expensive jewelry to sell? Don’t show a photo of it, put it on a beautiful model. Build that tailgate area instead of listing off what items are included. Show off the pop-up tent, 2 chairs, grill, and collegiate fan gear. Great product merchandising will make a big difference in your ability to sell items at a higher price during your auction. Take the time to focus on creating a well-lit, appropriately sized and located auction area with inviting displays. We feel strongly that if you do that, you will make a big impact on bidder engagement and auction revenue. Stay tuned for the next blog in this series which will cover another tip on how to improve your next auction event. Are we going too slow? Want to skip ahead and get all 7 tips? Then just download our Auction Tips eBook below and jump to the Head of the Class!